EL MONTE — A 14-month-old girl died Sunday after she was struck by a car being driven by her aunt in an El Monte driveway, authorities said. The name of the girl was not released Sunday, coroner’s officials said. The incident was reported about 10:20 a.m. in the driveway of the home where the family lived in the 12100 block of McGirk Avenue, El Monte police Lt. Ken Alva said. The girl was in her front yard with her 2-year-old brother and mother, police said in a written statement. “The victim’s aunt, (a) 28-year-old unlicensed driver, was backing northbound out of the driveway as the victim crawled toward the driveway,” the statement said. The driver failed to see the girl and struck her, causing major injuries, the lieutenant said. Rescuers rushed the injured toddler to the Methodist Hospital in Arcadia where she died at 11:23 a.m., police said. “The child was just out of the mother’s line of sight when the incident occurred,” according to the statement. The cause of the crash remained under investigation, and no arrests were made Sunday. Though the aunt did not have a driver’s license, he said, that did not appear to play a role in the accident. Additionally, the accident occurred on a private driveway, not a public street. LINCOLN HEIGHTS — A 15-year-old boy was shot to death in Lincoln Heights, even though he gave up his bicycle to a thief, and an 11-year-old girl was wounded by a stray bullet, police said Sunday. Miguel Machuca and another male, also on a bicycle, were confronted by two other males around 7:30 p.m. Saturday near North Broadway and North Mission Road, according to the Los Angeles Police Department. Machuca surrendered the bicycle but was shot anyway, said LAPD Officer Sara Faden. He was struck in his upper torso and died at a hospital. An 11-year-old girl who happened to be in the area was struck in the back by a stray bullet, Faden said. She was in stable condition. Anyone with information on the killer was asked to contact the LAPD at (323) 342-8957. DOWNEY — Whoever gunned down a Bellflower man in front of his wife and children in an apparent case of road rage in Downey was at large Sunday, police said. Juan Pacheco, 28, was shot about 6:30 p.m. Friday on the 105 Freeway while he was merging from the Lakewood Boulevard on-ramp, according to Downey police. “As the victim was transitioning onto the eastbound 105 freeway from Lakewood Boulevard, a verbal altercation occurred between the victim and the occupants” of a blue 2002 or 2003 Honda Accord with chrome wheels and dark-tinted windows, said Downey police Lt. Phil Rego. As the two vehicles neared Woodruff Avenue, a passenger in the Honda fired a round that hit the Pacheco in the torso, said Rego. His wife and two sons, ages 3 and 4, were in the van but were unharmed. Pacheco managed to stop the van on the side of the freeway and got out before he collapsed, Rego said. He later died at a hospital. Anyone with information about the fatal shooting was asked to call Downey police at (562) 904-2308. 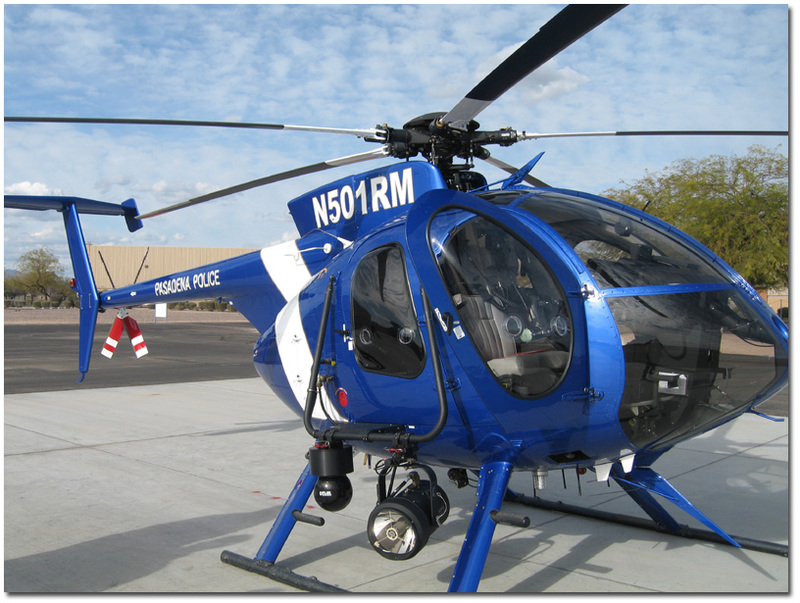 PASADENA — The Pasadena Police Department welcomed a new helicopter pilot to its Air Operations Section last week, officials said. Fourteen-year Pasadena Police Department veteran Officer Mark Mendenhall completed his Federal Aviation Administration certification Tuesday to become the department’s 25th helicopter pilot, Pasadena Police Chief Phillip Sanchez said in a written statement. The officer is no stranger to flying. “In addition to his helicopter certification, Officer Mendenhall is one of the few members of this section to also hold a (fixed-wing) pilot’s license,” Sanchez said. He has had multiple assignments with the Pasadena Police Department in the past, including the Special Enforcement Section and Counter Terrorism Section, the chief said. He also served as a team leader on the department’s SWAT Team. “His professional and personal accomplishments are exceptional and warrant our congratulations,” Sanchez said. PHOTO of a Pasadena police helicopter courtesy of the Pasadena Police Department. ALHAMBRA — Los Angeles County Supervisor Michael Antonovich has announced plans to propose a $20,000 reward Tuesday for information leading to the capture of the hit-and-run driver who fatally struck an elderly, wheelchair-bound Alhambra man late last year. Shih–Siang Ho died at the scene of the Dec. 1, 2009 crash at the 6th Street underpass at Ramona Road in Alhambra, police and coroner’s officials said. The driver of the unknown-type vehicle fled the scene and has not been found. Alhambra Police said Ho was believed to be heading home from his sister-in-law’s house when he was struck about 1:20 p.m.
Antonovich plans to propose a $20,000 reward for information leading to the arrest and conviction of the hit-and-run driver at Tuesday’s Board of Supervisors meeting, according to written statement issued by his office. Investigators are renewing their request for the public’s help in locating the hit-and-run vehicle and its driver, according to the statement. It likely had minor to moderate damage on the front, passenger side as a result of the crash. Anyone with information is asked to call Alhambra police Officer Brandon Cardella at 626-570-5119. HACIENDA HEIGHTS — A 77-year-old Whittier woman died Saturday in a solo-car crash on Colima Road, authorities said. Lynn Le, also known as Le T. Thi, was pronounced dead at the scene of the 10:37 a.m. crash on Colima at Camino Del Sur, California Highway Patrol officials said in a written statement. Le was driving a 1997 Honda Accord north on Colima when, for unknown reasons, she drove over a raised concrete divider and into southbound traffic, officials said. The Honda continued moving north in the southbound lanes of Colima at about 60 mph until it struck cinder block wall at the northeast corner of Colima and Camino Del Sur, according to the statement. The crash remained under investigation by the Santa Fe Springs office of the California Highway Patrol. GLENDORA — A man died Friday after his disabled pickup truck was struck by a car on the 210 Freeway in Glendora, officials said. Kevin Payne, 50, died at Los Angeles County-USC Medical Center just over half an hour after the 6:53 p.m. crash on the westbound 210 Freeway, just west of the 57 Freeway, coroner’s and California Highway Patrol officials said. His driver’s license listed him as a Los Angeles resident, though his vehicle registration information indicated he was from Hawthorne. He was standing along the side of the road near his Mercedes sedan while having his disabled Toyota pickup truck hooked up to a tow truck just prior to the crash, California Highway Patrol officials said in a written statement. Toby Okleshen, 36, of Las Vegas was driving a 2009 Dodge van westbound on the freeway. Payne was flown by helicopter to Los Angeles County-USC Medical Center where he was pronounced dead, officials said. The unoccupied Mercedes went off the road and burst into flames, but firefighters quickly extinguished the burning car and nearby brush that had ignited, Los Angeles County Fire Department Battalion Chief Mike Brown said. Witnesses reported seeing Okleshen’s van swerving and driving erratically just before the crash, CHP officials said. “We ruled out driving under the influence,” CHP officer Resa Rombouts said. Okleshen suffered minor injuries in the crash but declined to be hospitalized, officials said. The investigation was ongoing, and investigators continued interviewing witnesses Saturday. GLENDORA — A three-vehicle crash on the 210 Freeway left a man critically injured Friday, authorities said. The crash occurred just before 7 p.m. on the westbound freeway, just west of the 57 Freeway, California Highway Patrol Officer Krystal Carter said. A man estimated to be in his 30s was driving a white passenger van when the vehicle began to drive erratically and swerve across traffic lanes, officials said. “It sounded like he sounded some type of medical condition, possibly related to diabetes,” Los Angeles County Fire Department Battalion Chief Mike Brown said. The van struck a compact car in traffic, which went off the roadway and caught fire, as well as a pickup truck that was being loaded onto a tow truck along the right side of the road, the chief said. The driver of the pickup truck, estimated to be in his mid-40s, suffered major injuries including compound fractures to his legs, Brown said. He was flown by helicopter to Los Angeles County-USC Medical Center for treatment. The driver of the van declined to be hospitalized and was being questioned by CHP officers following the crash, officials said. The driver of the compact car was unhurt and managed to get free of the car before it became well-involved with flames, Brown said. All lanes of the 210 Freeway, both eastbound and westbound, were shut down briefly as rescuers landed a helicopter on the freeway to take the critically injured person to the hospital, she said. The eastbound lanes were re-opened after the helicopter picked up the patient, officials said, but only the carpool and left-hand lanes of westbound traffic were open as the investigation continued late Friday. The cause of the crash was being investigated by the Baldwin Park office of the CHP. EL MONTE — El Monte police are planning sobriety and driver’s license checkpoints Sunday and Friday. The checkpoints will be held at undisclosed times and places within the city, El Monte police Officer Eric Johnston said in a written statement. The purpose of such checkpoints is, “to identify offenders and get them off the street, as well as educate the public on the dangers of impaired driving,” the officer said. “Traffic volume and weather permitting, all vehicles will be checked,” he added. Funding for these checkpoints is being provided by a grant from the California Office of Traffic Safety, through the National Highway Traffic Safety Administration. PASADENA — Authorities jailed a woman and teenage girl Thursday after they allegedly led officers on a chase in a stolen car. Tabitha Valdes, 21, and a 15-year-old girl whose name was not released due to her age, were booked on suspicion of auto theft, Pasadena police Lt. Chris Russ said. Their cities of residency were not available. A third suspect fled from the car and was not found, he added. The incident began about 5 p.m. when officers spotted a car with three people inside that had been reported stolen at San Gabriel and Del Mar boulevards, the lieutenant said. The car, allegedly being driven by Valdes, led police on a chase that briefly got onto the 210 Freeway before all three people inside the car ditched the car and ran in the 300 block of North Madison Avenue, Russ said. A search of the area turned up Valdez and the teenage suspect, he said, though a man also ran from the car and was not located. He was described as Latino, about 6 feet tall, wearing a dark T-shirt and blue jeans.